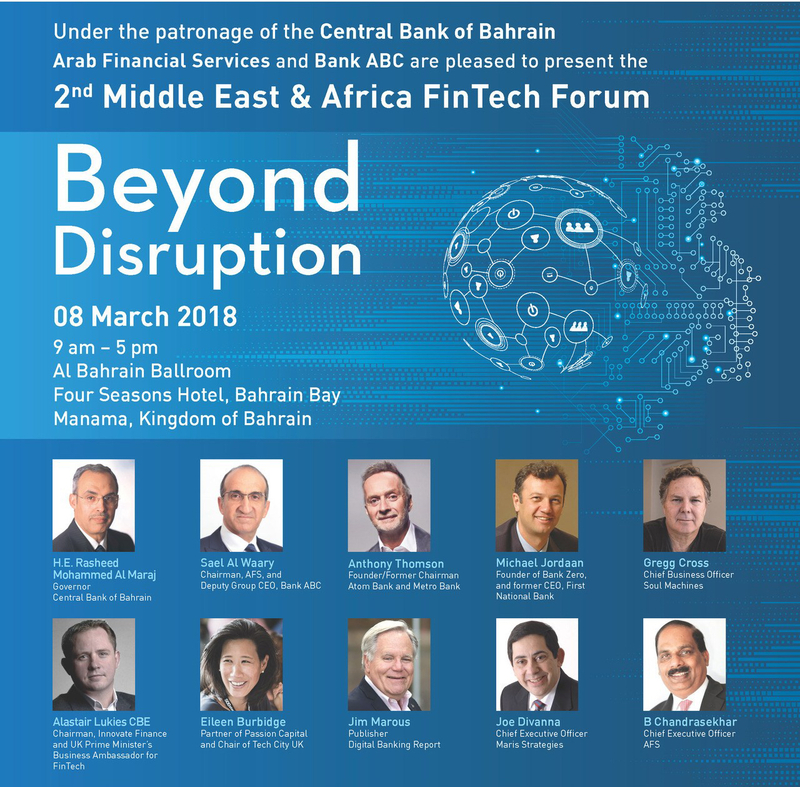 Manama, 14 January 2018 – The second Middle East & Africa Fintech Forum will be held in Manama, Bahrain, on 7-8 March 2018, under the theme Beyond Disruption. The forum will be opened by H.E. Rasheed Mohammed Al Maraj, Governor of the Central Bank of Bahrain. The event will be held under the patronage of the Central Bank of Bahrain and hosted by Bank ABC and Arab Financial Services (AFS). Beyond Disruption brings together leading and well regarded global experts and industry leaders in a highly engaging format of talks and discussions addressing the most pressing issues in the fast evolving FinTech landscape. The conference will tackle the biggest disruptors for banks in the near future. From the emergence of challenger banks to the cutting-edge advances in Artificial Intelligence to the rise of cryptocurrencies and the drive for greater financial inclusion across the globe. Keynote speakers include Anthony Thomson, founder of the first UK digital bank, Atom Bank and the award winning Metro Bank, and Gregg Cross, Chief Business Officer at Soul Machines, in addition to industry experts and leading FinTech commentators. The first AFS MENA FinTech Forum, held in March 2017, saw over 350 attendees with notable speakers such as Susanne Chisti, the author of FinTech Circle, and experts from PayTM India, FSS, Visa, McKinsey, IBM and ai Corp.